A Map of Brecknock Shire. The Road from Chester to Cardiff. 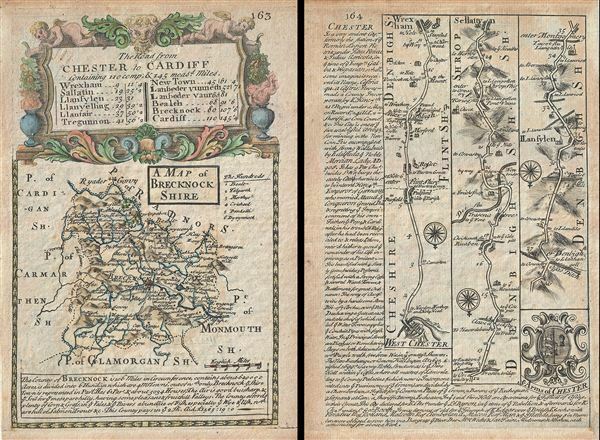 This is a scarce 1736 example of John Owen and Emanuel Bowen's map of the County of Brecknockshire, Wales. The map is printed on both sides. The map on recto features a detailed map of the County of Brecknockshire (also known as Brecknock or the County of Brecon) with a decorative title cartouche. Detailed information about Brecknockshire is included along the bottom of the map proper. Verso features the three strip road map from West Chester to Montgomery. Several towns and distances are noted, including Rosset, Wrexham, Ilansylen (Llansilin) and Llangedwin (Llangedwyn) in the Counties of Cheshire, Flintshire and Denbighshire. Several buildings, bridges, topographic features, vegetation and water bodies are noted. This map also features information about Chester along the bottom and left of the map and includes the Coat of Arms of Chester. Each strip map contains a compass rose and notes distances, in miles. Issued as page nos. 163 and 164 in Britannia depicta, or, Ogilby improv'd. Owen J., and Bowen E., Britannia depicta, or, Ogilby improv'd : being a correct coppy of Mr. Ogilby's actual survey of all ye direct & principal cross roads in England & Wales, 1736. Very good. Minor toning. Original platemark visible. Printed on both sides.